Charming Heritage style up down duplex. This main floor/upper unit has spacious room sizes, great light and expansive views of Kokanee Glacier, Kootenay Lake and Elephant Mountain. 2 Bedrooms and updated bath on the main with the spacious 3rd bedroom master occupying the whole upper floor. Private yard space behind established green hedge. 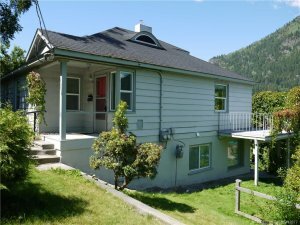 Well maintained property with new furnace and hot water tank, upgraded insulation and windows. Conveniently located within walking distance to downtown and the mall.